1) Cut 21 equal lengths of black Nymo cord. Try to make these about 20-24" long. Take each of these "warp cords" over the Thread Heaven two to three times (this will give these cords added strength while loom-working). Separate each thread into their individual grooves on the spacer bar at the top of the loom (the spacer bar furthest from you) Make sure you leave a 6-8" tail with the cord - the remaining cord away from you. When you have them all separated, take a small piece of tape and place it over all of the threads on the other side of the separator bar. Take the cord tails and lift off the small strip of wood on the warp peg furthest from you. 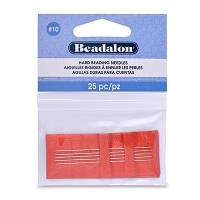 (If you are using another type of beading loom, you may only have to wrap the tails around the warp peg, there is no small strip of wood used to hold the cord tails in place). Wrap the end of the cord tails around the warp peg and replace the small strip of wood to hold the cord tails in place. (You should use a strip of tape to wrap around this warp peg to make sure that the wood strip doesn't pop out when you're looming). 2) Pull the cording down through the other spacer bar closest to you. Make sure that the cording is nice and straight, and then use another piece of tape to secure the cording as it comes through the spacer bar. Pop the small strip of wood off of the closest warp peg, and then take the cord tail ends (there will be a substantial amount of excess cord on this end, don't worry) and wrap them around the warp peg. Re-insert the strip of wood, and use a couple of pieces of tape to secure this strip of wood on the loom. 3) Tighten the screws on the top warp peg. Roll the bottom warp peg so that the warp cords tighten up along the loom. Make sure that the warp threads are tight, but not twang tight. They should bounce back if pressed on, but not so loose that the cords stayed relaxed. Tighten up these screws and you're ready to loom! 5) Thread the 2 yd length of Nymo onto the leftmost warp thread and tie it down with a couple of overhand knots. Thread the cord behind all of the warp threads, and thread a needle onto the cord. 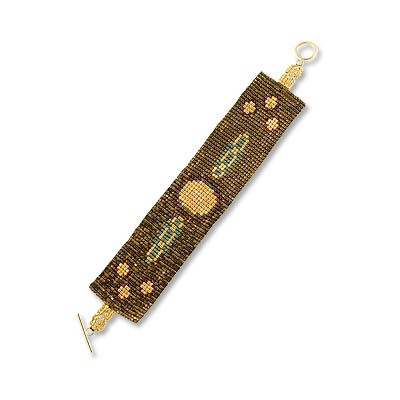 Pick up the necessary beads to make up row #1 on the design and press the beads up through each of the warp threads. Take the needle around and back through the beads that were threaded on, this time though, over the top of the warp threads. This is what will hold the beads in place. 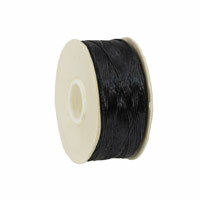 This cord is now referred to as the "weft" thread. 6) Continue with the pattern until you are done. 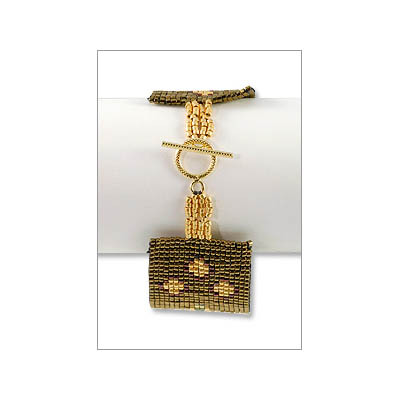 If you need to add any additional cording, please refer to the "How to use a Bead Loom" video in our Video Library to see how that is done. 7) When you're done, secure the weft thread and take the work off of the loom. DON'T cut off any of the warp threads, you need to secure each of them in your loom work. 8) Starting with the warp cord end on the right (it doesn't matter if it's at the top or bottom of the design), thread on the needle and take this warp cord through the two seed beads directly underneath this, left to right. 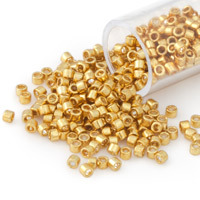 Then, take the needle through the two seed beads directly under the previous two and the next two under that. Go back and forth for about six to seven rows, pull the needle off the warp cord and then cut the cording away from the work, no knot necessary. 9) Repeat step #9 for each of the warp threads on both ends, leaving the middle four threads to secure the toggle clasp. 10) Looking at the four unsecured warp cords on one end of the bracelet, take the rightmost cord and thread on ten Galvanized Gold Delica beads. Then, wrap the warp cord around the connector loop of the Toggle clasp half (either half) and back down through the ten Galvanized Gold Delica beads. Now, you can secure this warp cord like all of the others. 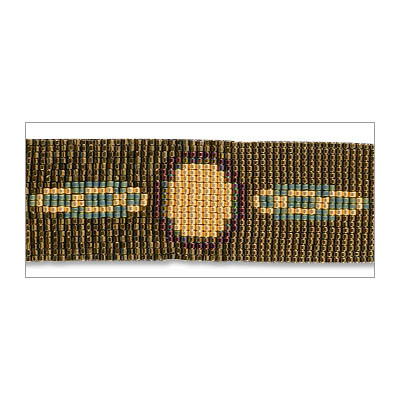 With the second to rightmost warp cord, thread on four Galvanized Gold Delica beads then go through the fifth bead on the rightmost cord. Thread on four more Galvanized Gold Delica beads and then take the cord around the connector loop of the Toggle clasp half and back down through the beads strung on this cord and secure like before. 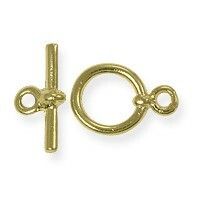 Flip the work over and repeat this step again with the remaining two unsecured warp cords on this end of the bracelet. 11) Repeat step #10 for the other end of the bracelet. When complete, double check your work and make sure that all of the tails in your loomwork are cut nice and flush with the loomwork. Nice Job!